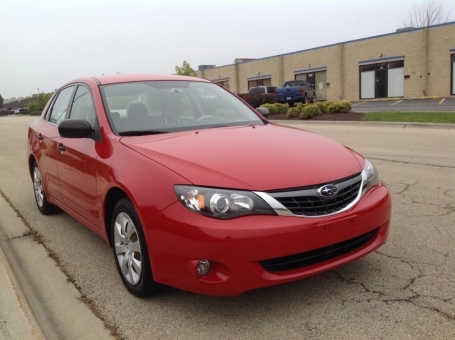 This 2008 Subaru Impreza is a midsize sedan with a fuel efficient 4 cylinder engine, 5 speed manual transmission, spacious and comfortable interior, and ample trunk space. This edition is newly detailed, clean, sharp,and in good working order. The Impreza has distinctive style, a terrific exterior color, and is fun-to-drive. The interior is sharp with beige cloth seats, black, beige, and metallic dash,with metallic accents. Options include a hard top, power windows, mirrors, locks, steel wheels, newer Goodyear Assurance tires, AM-FM stereo with satellite radio and CD player.